New Delhi/Agartala, April 16 (IANS) The CPI-M on Tuesday held demonstrations in New Delhi and Agartala demanding repoll in 464 of the 1,679 polling booths in the Tripura West Lok Sabha constituency, and free and fair poll in the Tripura East seat on April 18. Communist Party of India-Marxist (CPI-M) General Secretary Sitaram Yechury on Monday visited the Election Commission and submitted a memorandum with videos and photographs in support of their demand. He was accompanied by party candidate for the Tripura West Lok Sabha seat Sankar Prasad Datta and other leaders. The full Election Commission, led by Chief Election Commissioner Sunil Arora, later held video conference to review poll preparedness in some constituencies of West Bengal and Tripura going to polls in the second and third phases. Addressing a rally in Agartala, former Tripura Chief Minister Manik Sarkar said it was now up to the EC to ensure that democracy was protected in India. "The Left parties have given the EC specific evidences -- a large number of videos and photographs -- to prove how polling was turned into farce on April 11," said Sarkar, also a member of the CPI-M politburo. Tripura Left Front convenor Bijan Dhar, who led a five-member delegation to Chief Electoral Officer (CEO) Sriram Taranikanti to submit a memorandum on Sunday, said the CEO said he had received over 800 complaints from Tripura West, which were being scrutinised by the Returning Officer. Dhar, a CPI-M central committee member, said, "Since the first parliamentary elections in 1952, Tripura had never seen such a farcical and violent polling as was witnessed on April 11. "Even during the Congress rule (before 1978 and 1988-1993), there was never such a mockery of polling. BJP goons drove out polling agents of the Left and other parties' from hundreds of polling stations and prevented thousands of opposition supporters from casting their votes." Demanding effective deployment of central and state forces for the second phase of polling, CPI-M state Secretary Gautam Das said the governments at the Centre and in Tripura kept the security forces away from poll duties on April 11 to ease rigging by BJP workers. 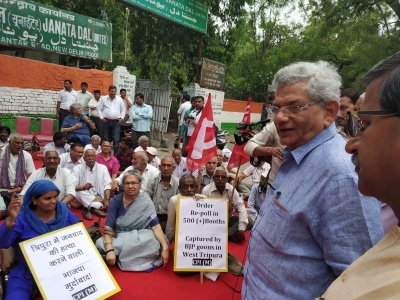 Leading a demonstration near the poll panel office in Delhi on Tuesday, Yechury said democracy was being killed and rights of the people were being trampled under the BJP regime. "I did not see a single central paramilitary force jawan in Tripura on April 11. The entire central force sent to Tripura for election duty and the state forces were kept in barracks by the BJP governments to facilitate rigging," Yechury said. He said the EC didn't listen to the Left parties' demand for action against poll code violations. "It woke up following the Supreme Court order on hate speeches by various leaders in UP. Both secularism and democracy are being attacked under the Narendra Modi-led government," he said.